I’ve shared a little bit but I thought I would start a journal post to record our story and use it as a reference point for progress. I’m also the kind of person who is soothed by speaking or writing thoughts down and I’ve enjoyed reading the stories of others here as well. I come from an area where horses used to be a big hobby, but not so much anymore. Long before I was a thought, Mom worked with a stable that bred Arabians. She rode trails and competed in some Western style showing. In Dad’s family they owned horses both for pleasure and for farm work. The local Fair Board hosted a variety of horse shows that drew big crowds for the area. Mom’s last horse passed away when I was in grade school. Even though my aunt also loved to ride and my grandfather owned Tennessee walking horses at the time, it just never came about that I was taught to ride. I think at the time I liked the horses on the ground but was too intimidated to want to learn. The stable mom worked at in her youth has been empty for as long as I can remember and was recently turned into just a garage/storage facility for another business. 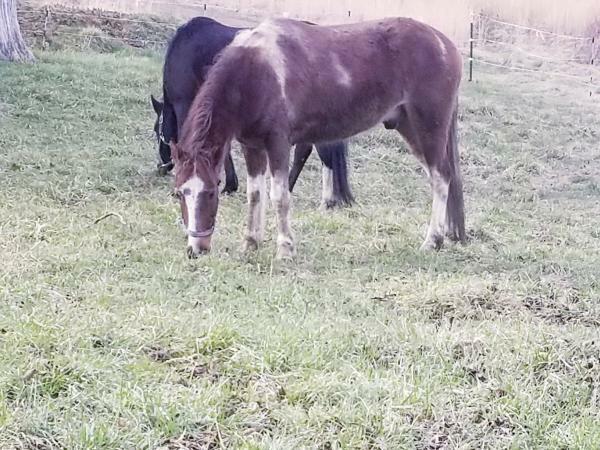 My aunt was recently running the only remaining small local boarding stable owned by the Fair Board, but none of the current Fair Board members want anything to do with horses. They allowed her to host shows because they earned money from them but they were no help in the planning or execution of shows. We recently moved her horses and mine onto my parents property because they wanted to raise her rent AND the price she was required to pay them to use their arena for each show, so she decided not to renew the contract. On Christmas eve, my aunt was joking with Dad that she had the “perfect Christmas present standing in the barn.” With agreement from mom and I, she gave Dreama to us and we boarded her at my aunt’s stable until the recent changes. Mom has admitted since then that if she had seen Dreama handled more, she probably wouldn’t have agreed for me to take her and start working with her. The woman who gave her to our family said she was 20 years old. Even with my lack of horse experience I can tell you that there is no way this is a 20 year old horse. The next time I have the vet out, I am going to try to remember to ask him what his estimate on her age is, but my aunt thinks it’s somewhere between 12 and 14. She has a lot of energy and is admittedly a little much horse to start with in my opinion, but I’m definitely not sorry we decided on keeping her. She was the catalyst for something I’ve been dying to do since I was a teenager and with me recently having accepted a full time job with decent pay and benefits it seems like the perfect time to start as I will be able to afford basic equipment and vet care. Despite her energy and bouts of stubbornness (which probably would be nothing for a more experienced rider), she has done well being under saddle again and doesn’t seem to be scared of much. It seems like at some point in her life someone has worked with her quite a bit. We spent a lot of time while my aunt was still running the boarding stable walking the isle of the barn and making turns, getting my balance. This was my first ride outdoor in the ring, holding the reins incorrectly, leaning too far forward and looking flat horrified, but we made it around several times at a walk without incident. I am looking into more equipment on my own at this point. Most people here don’t ride with a helmet but I want one. I recently got some good advice on the forum about shape and fit and will be traveling a bit soon to find a tack shop and try some on in-store. I’ve also been reading and watching videos on training. My mom and aunt have been a big help, but there are aspects of training that I want to study more. I want better manners on the ground and I don’t want to have to man-handle my horse to do it, because I don’t have the physical strength to do that and I have also read and watched some things about more effective ways to accomplish this. There also aren’t any horse trainers locally that I would trust. So I will likely also be spending a lot of time on the forum reading advice and asking my own questions. I was encouraged to join the forum because I saw a wide array of stories and situations. 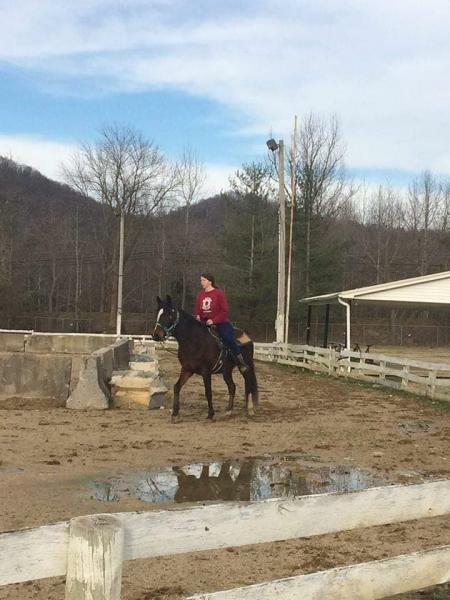 From members who board and compete in shows and have access to good trainers and professional riding lessons, to others who live in areas like mine where people usually only own horses if they have a field with a little shelter to turn them out in and only have family/friends to teach them. I wish there were somewhere that I could enroll in lessons. My university has a beginner’s class that I could afford the tuition for now, but the courses would overlap the hours of my job. There might also be someone local or that I could travel to that would teach lessons on the weekend, but if possible I would rather devote weekends to training and building a better relationship with Dreama. So that's us right now! I feel woefully unequipped but I don't want to give up on this. Working with this horse is a physical pouring out of energy that for some reason eases my anxiety about other things in life and makes me happy. kewpalace, Twalker, knightrider and 4 others like this. CONGRATS on this new 'education' in your life. ;) It's a steep, but not insurmountable, learning curve if you didn't grow up on and around horses.... but I think you'll find it's one of the most rewarding things you can do with your time (other than be a mom and/or a spouse). knightrider, JoBlueQuarter and CopperLove like this. 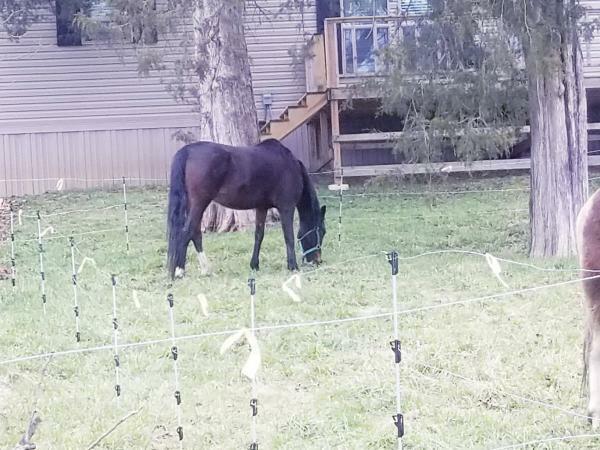 Since the fencing is still being worked on and the horses haven’t had any turn-out time yet, I thought it would be nice for Dreama to be able to get out and get some sun and grass this weekend. Hopefully within the next week the fencing will all be completely done and they’ll all be getting turn-out time to run their sillies out and we can get back to more work together. I’ve decided it may be a long-shot, but I am going to attempt to find someone in the area who might teach evening riding lessons. My work schedule may conflict with any teachers I find, but it’s worth a try. I would enjoy having more instruction and gaining some confidence in the saddle. For this weekend I just wanted to spend time with her and work on leading. Leading is something that we have a few problems with on the best of days, which I’m sure is because I am still learning how to lead and discipline reasonably and consistently. Yesterday she was either pulling me around or ignoring cues to walk, with her head anchored down in the grass. I can’t blame her for being excited for new grass; we can have fun but we also have to listen. Mom handed me a crop and said, “Just tap her a little on the hip and tell her to move.” So, having seen training videos of people using a crop as sort of an extension of their arm to touch and give direction, I pulled the lead and when she didn’t respond, gave her a little tap. As soon as the crop touched her hip she leaped forward. Shot away from me, bounced, ran. I blistered and tore open blisters in my left hand all in one motion before I had time to think about what was happening. I caught the rope in both hands and held on, and when she hit the end of the lead she turned to face me, ears raised in my direction and snorted. For a moment I was afraid I had just ruined our progress… was she afraid of the crop? Would she act out now because I had done something incorrectly? Instead, she came back to me. Ears, head and neck relaxed. She followed me with slack in the lead rope, stopped when I stopped, made right turns without trying to walk through me. It was almost like, “Oh, I guess you really meant it, huh? Ok, I guess if I have to pay attention I will.” The only thing we still struggled with was backing up. I think the sudden burst of speed had more to do with pent-up energy than with fear. greentree, knightrider and LoriF like this. That is a beautiful horse! So glad you started a journal! knightrider and CopperLove like this. Dreama is beautiful. I"m glad that you have a chance to have this experience. Is your mom or aunt helping you any with your education with horses? 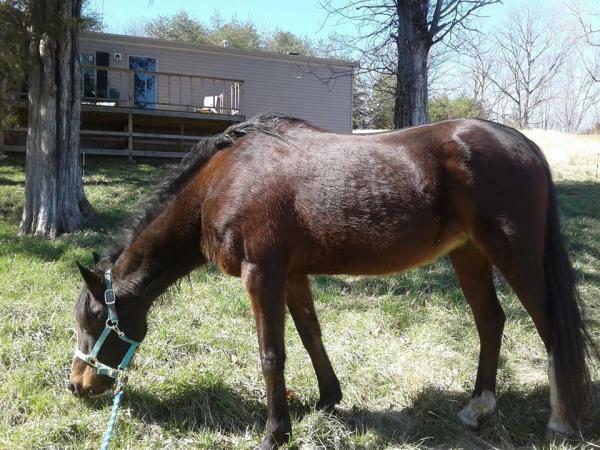 It would be great if you can find the help that you need with her, it would make it so worth it entering into the world of horses. I can definitely see the arab in her. @LoriF My aunt got me started in the saddle, but with having to move and quit her business and some other family things going on she isn't around as much right now. Our horses are all together though and I hope that when I've had some more experience we might be able to trail ride together; there is a trail around the back of Mom and Dad's property we plan to check out and see if it needs any clearing. Mom is always present when I work with Dreama. She has a lot of good advice to give but it has been over a decade since she owned horses and rode, and has to be somewhat careful about getting pulled around too much because she has problems with some pinched nerves in her neck. I contacted two different places today about riding lessons though, and I think both of them teach evening lessons! Either one would add extra travel after work but it would be well worth it. The one I am waiting to hear more back from about times/pricing is about an hour away from where I work, and about a half hour from where I live. I think it would help me tremendously to be able to ride during the week building my skill level, comfort and confidence while still being able to work with Dreama on the weekends. They also offer access to campgrounds, trail rides on their property, and access points off their property into trail riding areas of Daniel Boone National Forest, so it could be a very nice place to be involved with. I went ahead and called one of the places I had contacted about riding lessons on my lunch break today. If the weather stays good, I'll probably be visiting for the first time at the end of next week! It is really a ranch/campground business run by a married couple, and to top it off it is actually located in the same town I live in and I never knew it existed. It will take me a little over an hour to get there from the town I work in, but it is closer to where I live and will be a shorter trip home than some other places I looked at. The woman I spoke with seemed very nice on the phone. She asked about my skill levels and goals, asked if I would be needing a lesson horse or if I owned my own horse that I wanted to work with. I told her I was very new to riding, and that I owned my own horse and had ridden her a hand-full of times but only at a walk and only inside a barn or a ring, and that I would be in need of a lesson horse as I wouldn't be able to transport my mare to lessons and also because I feel like I need to gain more skill and confidence as a rider to improve my handling of her. They don't train riders and horses for showing; they are mainly focused on increasing a rider's skill and comfort level with the horse, and just general casual trail riding for fun. Which really is what I need, I'm not interested in any kind of showing at this point and if I do become interested I can look for other resources as needed. I told her my main goal in the end was to be able to ride trails comfortably with my mare. These beginner lessons will be $25/hour for private lessons which I think sounds very inexpensive comparatively. As I move forward if I am ready for more detailed lessons in handling/training after I am comfortable, her husband teaches those classes. That would be a different price level understandably, but I expect it would still be a very reasonable price based on their beginner rate. Eventually if I wanted to, she said it would probably be a good idea to have some lessons with Dreama herself, and they could help me work out a way to transport her if needed. (Although I think my aunt would probably let us borrow her horse trailer if needed, or drive there with me.) I don't know what the pricing would be on something like this, I imagine I would have to board her there. But when I start my lessons I intend to ask about this so I can maybe plan and save money back for this in the future if things go well with these lessons. Their property also is located right next to Daniel Boone National Forest Land. They offer various kinds of camping on their property, and also areas to park horse trailers and either trail ride on their property or trail ride in the National Forest. I am extremely excited for my visit, and hopeful that if things go well I might make some connections with other local horse people. Mom sent me these photos from home today. The fence is finally up and the horses get to play outside. The second was taken from her back porch. I told her she had very expensive lawn ornaments. The reddish boy with the white marks in the second photo is "Apache", he belongs to my aunt's fiance and he is like a puppy-dog of the horse world... always wants attention and scratches and lets mom hug his face and stroke his nose... except he stands and beats his foot against his stall when you walk away and he isn't getting attention anymore. Hopefully, that won't be a problem anymore since he will have more time outside now to ease the boredom. 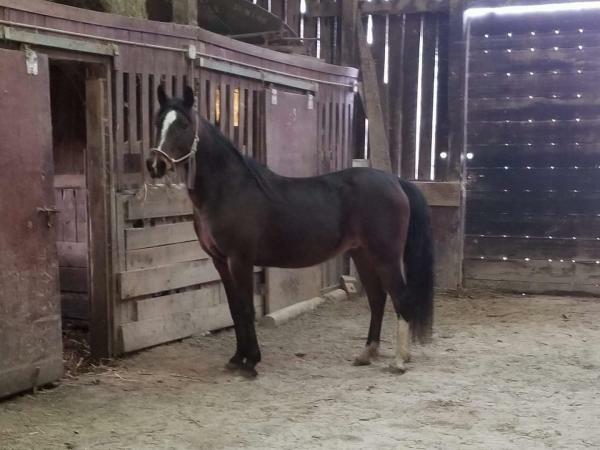 They tried to sell him last Summer... mom loves him so much I've had thoughts about making an offer if they attempt to sell him again and IF I see him under saddle, and IF he reacted well to mom in the saddle. All just random thoughts. I'm happy to see them outside finally though. Good luck with the lessons, the trainer sounds like just what you need right now. 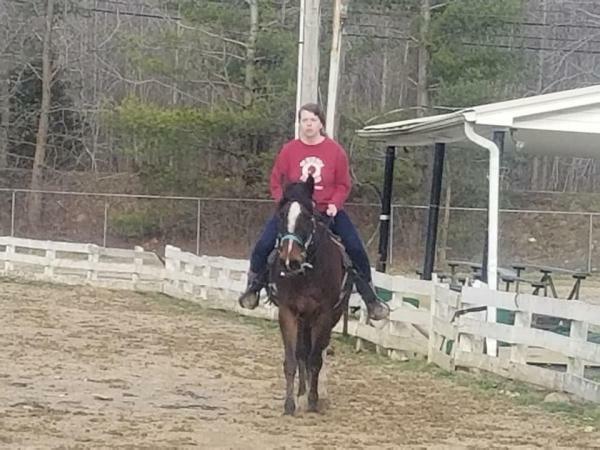 I had my first riding lesson last week, which was mainly an intro to the property and meeting the owners and horses and getting some history on each other, I did ride for a little while on the horse I will start out with lessons on. I was surprised I hadn't heard of their business before, but as it turns out they are pretty new to the area. A husband and wife own the property. They said they have already done a few guided trail rides in the area but don't have many individual riding students yet. They are in a great location with access off of their property into national forest trails that are open to trail riding Eventually they will be offering camping on their property or trailer parking for visitors who want to ride into the national forest but have a secure place to leave their trailers/vehicles/belongings. I hope they do well in the area and I am excited to see them grow. To my understanding, the husband has trained most if not all of their horses. They prefer mustangs and they have a young mare they are currently in the process of taming. Their riding lessons are mainly geared toward casual riding for fun and just getting comfortable in the saddle and learning how to handle the horses, which is really what I am in need of most at this point. They were very encouraging. There was some talk of eventually bringing Dreama for us to work with her specifically. The husband mentioned something about helping me work with her at no additional cost, but I'm not sure what the pricing would be on that. I assume it would be a boarding fee; I'm not sure if he meant the additional work would be included in the boarding fee, or if I would be paying boarding and lessons and the training work would be included in the lessons fee. I'm not sure yet if I would do that or if I could afford it, but I am going to keep it in the back of my mind and save some additional money back. If it's something I could afford, it would be very beneficial. Until I met this couple I really was unsure of any trainers in our area. I plan on taking lessons with them for a few months and seeing where it goes from there. They also have two little boys, 4 and 5 or 6 I believe who were eager to have someone new to show everything to as well lol. The youngest wanted to show me their new blue healer puppies... and their two calves, and the horses, and the mulch pile, and their vegetable starters for the garden, his new boots, his bike he got for his birthday... and needed to know, did I have a horse? What kind of horse? What was her name? Did I have a dog? A house? Was I camping tonight? Why didn't I have cowboy boots? I have about as much experience with young children a I have with horses (hint: not very much) but it was pretty adorable and very welcoming. I didn’t get to visit my parents last weekend, so this weekend was the first time I had saddled Dreama in probably a month, between the barn moving and not having a fenced area and some prior weekend engagements. We are working MUCH better together with leading. I am a lot more confident on the ground and she really pays attention to me without trying to yank me around and eat grass. However, all bets are off as soon as the saddle comes out. She refuses to stand still to put tack on. She’s done this since we got her and I don’t think it’s because she is scared of the tack or that it’s hurting her, because once you finally do get the saddle and bridle on she immediately relaxes and is ready to work. Once the tack is on, she will walk with me at my shoulder without a lead rope with only a few errors every now and then when turning. I am hoping that over time she will realize she can’t avoid the saddle and that moving around to avoid it will become tiresome and not worth the trouble. This is definitely something I am going to have to look into though, to see what I can do to train her to stand still. My aunt enjoys participating in “fun shows” that are close enough to home; the kind of horse shows that aren’t breed specific but typically performed western style for a variety of skill levels. I’m not sure how common these are in other areas. The one coming up has things like halter class, open pleasure, gated pleasure, some games on horseback, etc. She wants me to go with her and enter Dreama into a halter class. Even though I have no experience I think I may do it… they really are pretty casual shows and everyone seems to have a lot of fun. I think it would mean something to my aunt as well if I want to participate with her.